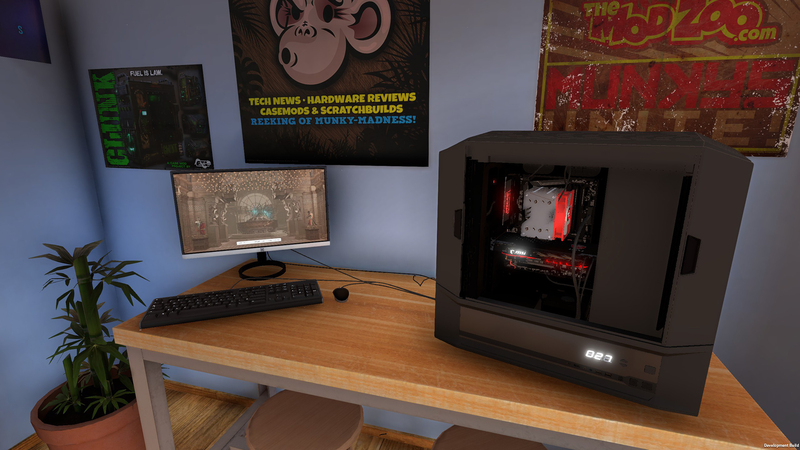 PC Building Simulator is a computer build simulator. If you always wanted to collect the computer of your dreams, then for a start you can do it virtually, in this game. You can collect a variety of configurations and test them for the test. Of course, this is just a simulation, but the results are as close as possible to the real ones. 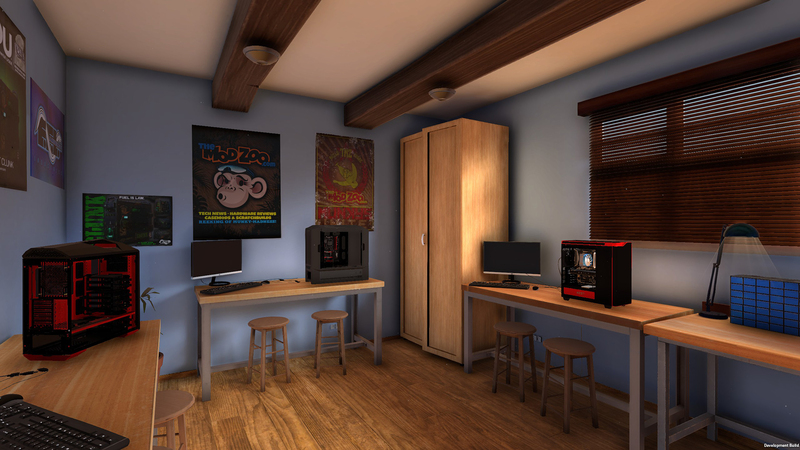 So that you will not be bored simply to collect all possible variations of the PC, there is a story line in the game in which you will take orders from customers to assemble computers for them, taking into account their wishes. Some orders will be quite specific, so you will have to try hard to realize what the client has conceived. Download & install Update v1.0.1 / v1.1, in game folder. This game has been updated 14-03-2019, 15:15 to the latest version v1.1 (upd.14.03.2019). New CPUs: Intel Core i9-9900K (20), Intel Core i7-9700K (20), Intel Core i5-9600K (20), AMD Ryzen Threadripper 2970WX (28) and AMD Ryzen Threadripper 2920X (28). New Cases: Fractal Design Focus G (20), Fractal Design Define R5 (19), Fractal Design Node 202 (29), SilverStone RVZ03 (14), SilverStone LD01 (14), Raijintek METIS (12), Raijintek STYX (30), NZXT H200 (29) and NZXT H400 (29). New Case Fans: ARCTIC F12 / F14 (11) and Fractal Design Silent Series LL 120mm (26). CPU Coolers: ARCTIC Freezer 12 (13), ARCTIC Alpine 12 / AM4 Passive (14), ARCTIC Freezer 33 (13), Raijintek LETO PRO RGB (11) and Gigabyte ATC700 (11). New RAM: G.Skill FORTIS (2), Ripjaws 4 (7), Flare X (7), Sniper X (7), Ripjaws V (7), Trident Z (15) and Trident Z RGB (13). New PSUs SilverStone SX500-G (12) and SilverStone SX650-G (12). New Motherboard: ASUS ROG ZENITH EXTREME (23). Updated Free Build introduction text to explain where cases are now stored, in case you missed this before - they are in your inventory now! Passive CPU Coolers now have an effective air flow statistic to better show their cooling potential. Fixed a bug that would cause the Continue option to still display on the main menu after deleting all save games. Fixed a bug with budgets on jobs that request upgrades to run certain programs. Fixed a bug with the NZXT Kraken X62 not fitting in the front of the NZXT H500. Unified the camera position when using a monitor across all benches so the view is from the same position. The missing part of the Raijintek PAEAN USB casing has now returned. Fixed a bug on the SilverStone RVX01 where you couldn’t remove a case panel with certain job computers. 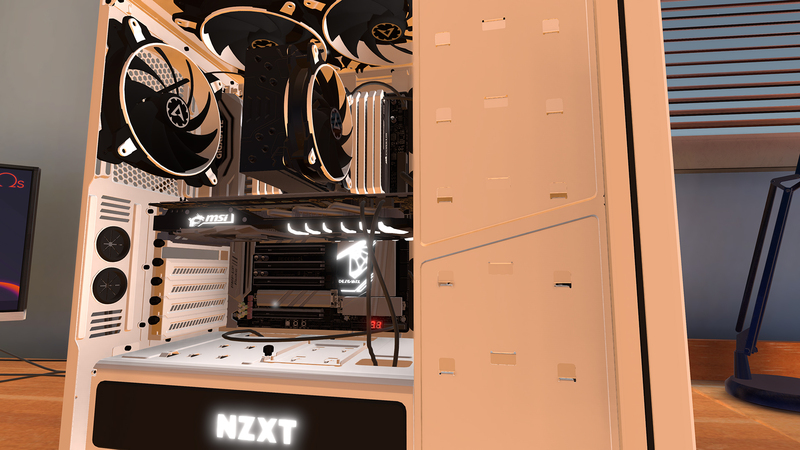 New Cases: DEEPCOOL MATREXX 55 (10), GAMERSTORM NEW ARK 90 (28), THERMALTAKE View 37 RGB (24), GAMERSTORM TRISTELLAR SW (30), GAMERSTORM Genome ROG Certified Edition (28), DEEPCOOL EARLKASE RGB WH (17), GAMERSTORM Quadstellar (30), THERMALTAKE View 91 RGB (30) and THERMALTAKE Core P5 (26). Overclocked Edition Cases: NZXT H500 - Re-Animator (26) and NZXT H700 - Extinction Wars (27). New GPUs: NVIDIA GeForce GTX 1060 Founders Edition (6), NVIDIA GeForce GTX 1070 Founders Edition (11), NVIDIA GeForce GTX 1070 Ti Founders Edition (19), NVIDIA GeForce GTX 1080 Founders Edition (13), NVIDIA GeForce GTX 1080 Ti Founders Edition (21), NVIDIA GeForce RTX 2070 Founders Edition (23), NVIDIA GeForce RTX 2080 Founders Edition (25) and NVIDIA GeForce RTX 2080 Ti Founders Edition (27). New Motherboards: NZXT N7 Z390 (20), MSI B450 TOMAHAWK (19), GIGABYTE GA-B250M-Gaming 5 (4), GIGABYTE X299 DESIGNARE EX (29), GIGABYTE X299 AORUS Gaming 9 (28), EVGA X299 Micro (30), EVGA X299 FTW K (30) and MSI B450I GAMING PLUS AC (20). New RAM: GIGABYTE AORUS RGB (14). New CPU Coolers: ARCTIC Alpine 12 CO (3), ARCTIC Alpine 12 LP (3), GAMERSTORM Fryzen (29), DEEPCOOL GAMMAXX C40 (22), DEEPCOOL GAMMAXX 400 (22), DEEPCOOL GAMMAXX GT (22), THERMALTAKE Riing Silent 12 RGB Sync Edition (19), THERMALTAKE Engine 27 1U Low-Profile (8), GAMERSTORM Castle 240 RGB (24), GAMERSTORM Castle 280 RGB (24) and GAMERSTORM Captain 120 EX RGB / Captain 240 EX WHITE RGB / Captain 360 EX WHITE RGB (24). New Case Fans: ARCTIC BioniX P120 / BioniX P140 (13), DEEPCOOL RF 120 / RF 140 (14), THERMALTAKE Pure Plus 12 LED RGB (28), THERMALTAKE Riing Plus 12 LED RGB / Riing Plus 14 LED RGB (28), GAMERSTORM MF120 (30) and MORTONI Heat Away 90 (1). Fixed the maximum PSU length of the Thermaltake View 91 case. Fixed an issue with some top case fan and radiator slots being blocked by the dust filter on the Thermaltake View 91 case. Fixed being able to add/remove front case fan brackets while the fans are still in place on the Thermaltake View 91 case. Fixed the maximum GPU length allowed in the Thermaltake Core P5 cases. Fixed the wrong PCI slot screws being used when installing a GPU in the Thermaltake Core P5 case. Fixed 4 slot NVIDIA SLI bridges not appearing where they should. Fixed the Overclocked Edition cases appearing in the shop if you don’t own the DLC. Fixed an issue with the Raijintek Ereboss blocking RAM meaning neither can be removed. The generic SLI bridge will no longer appear on RTX GPUs when in a 2 slot configuration. NVIDIA NVlink bridges only support 3 & 4 slots configurations to no NVLink bridge will appear when two RTX cards are right next to each other.